Nigeria has emerged as one of the key growing countries in Sub-Sahara region. Increasing investments, government initiatives and surging spending have improved the economic conditions of the country. However, the country is affected by increasing terrorist activities and crime rates. To check these, deployment of electronic security systems primarily video surveillance systems is witnessed especially in Lagos and Abuja. Amongst all verticals, government & transportation vertical has generated majority of the market revenues. Industrial & manufacturing vertical is another key emerging vertical, wherein oil & gas sector is the leading contributing segment. 13.4	Hangzhou Hik-Vision Digital Technology Co. Ltd.
13.5	Hanwha Techwin Co. Ltd.
Nigeria is the second largest market for video surveillance in Sub-Saharan region. On account of rising security concerns predominantly, terrorism and crime rate, the country has deployed nearly 2,000 video surveillance cameras in Lagos and Abuja during 2010-12. The government of Nigeria is likely to invest in security systems & equipment in other states as well. Additionally, analog video surveillance systems accounted for majority of deployment owing to low IP video surveillance market penetration in the country. However, Nigeria is registering potential demand for IP video surveillance systems in industrial & manufacturing vertical. Apart from this, Nigeria is also witnessing sharp growth in adoption of hybrid DVRs which are capable of connecting both IP and analog cameras. 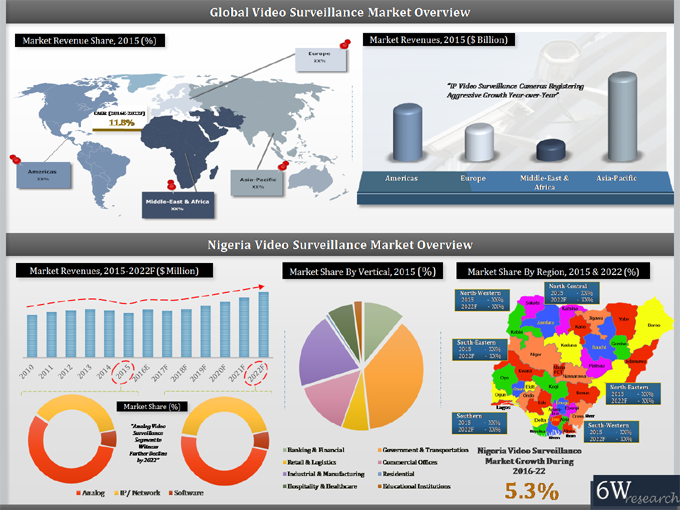 The major companies in Nigeria video surveillance market include- Avigilon Corporation, Axis Communications, Bosch Security Systems, Hikvision, Hanwha Techwin (Samsung), Pelco by Schneider, Vivotek and ZTE Corporation.